Capitalists@Work: Question time - guess the questions. Question time - guess the questions. Its that time again. Team captain Sarah Teather will also be joined by Alan Johnson, Ken Clarke, Richard Littlejohn and Victoria Core. Show comes from Stevenage. More entertaining panel than usual. Usual rules. Maximum of 6 guesses and bonuses for picking the right obfuscations, soundbites, tangents or damn, damn lies. 1 - The chancellor's debate. Does it mean the leader's debate will be an even bigger yawn. Chance for all to talk about saint Vince. 2 - Petrol prices/tax rises. Are the government deliberately trying to stoke up inflation? 3 - CBI. Has Labour now lost the business sector? 4 - Moscow and Islamic terror. Why was this only the fifth item on the news, behind Rooney's ankle? Chance for Johnson to say nothing much. 5 - Knife crime. Alan Johnson says knife crime in Victoria station is a blip. Another chance for him to say much and nothing simultaneously. 6 - Fox hunting. Why do the anti hunt hate Toffs so much? Is it envy? and why did Dave feel the need to get involved. What he gains in countryside votes he loses from city students. Winner gets to force the BBC to choose a Lib Dem to appear who isn't Sarah Teather. NI debate, Northern Ireland will hold balance of Tory Power, back to troubles? Olympic Tower at £25m looks cheap, £250m later, Boris will be hung from it. PS: Pope and Bishops, believe in Tony. Is Gordon Brown a cuckoo in the Labour nest? Flatter taxes, higher tax thresholds, fewer benefits? Restore smoking rooms in pubs. Rebuild Skylon for the Olympic games, not the vertical shambles planned. Is discussing various forms of PR torture? Do incomers dilute the social capital? 1) should goldfish grandmother have been curfewed and tagged ? is this what Brown's Britain has brought us to ? 2) legal aid for Mr Q's colleagues as they face court over expenses - is this what Brown's Britain has brought us to ? 4) snow in April - is this what Brown's Britain has brought us to ? 5) Bob Crow being cheated out of his strike by the courts - is this what Brown's Britain has brought us to ? Baby P/SS/families - Littlejohn is one so I expect some comment about families/divorce/typical DM rant. Spare us from a question about Wayne Rooney's foot. None of you mentioned Joanna Lumley. Well, she was a dead cert. No, not like that. To help improve the popularity of the show. Second week the audience have been against Labour. Now will the BBC tweak the audience or listen & allow a more balanced view of Gordon Brown's track record? Don't hold your breath. Missed it so quick scan on Iplayer..
Q1 - Major business on NI tax disaster. Have Tories sealed the deal. Alan Johnson saying unemployment is low so its OK? The same argument as there was for spending. Its not as bad as we feared so we can afford more? Dimby for once pins Johnson down. Q2 - Super Vince was the winner of the debate. Some polling says Ken C. is the nations choice for chancellor. I would have him in the Mandelson role as business and industry. Too old for chancellor now Ken. Q-3 Is President Blair a help or a hinder to Labour. Allows ST to dis him, Coren to say that seeing Blair was like meeting an old, cheating boyfriend again. Very good line. She should put into a column. Q-4 Gordon Brown's dodgy statistics and immigration. Amazing really. He has been called tractor stats Brown for years. The "Brownie" has been around for years. Now, suddenly, the press pick up on his ..mis-spokes. He has said 3.8 is 2 or 0.1% is 1% all his career. The great figures manipulator as Littlejohn said. Poor Johnson looks like he has a mouth ulcer.Keeps sucking in his cheeks. Q-5 Joanna Lumley beats the politicians. Well nearly.. Apparently Gordon Brown phoned her up. Poor women. Lets have a look at the old scoreboard..
Hatfield girl - 1 for taxes. Is Blair the cuckoo? Hello Philipa - Chancellors / tax and Blair. Seven guesses but we use treasury rules here. Call it 6.1. So 3 correct answers making you the champion. You get to choose the next Lib Dem on the panel.Pick a good one. Woking is the venue next week. This is a possible Lib Dem take from Tory. I worked there for years. 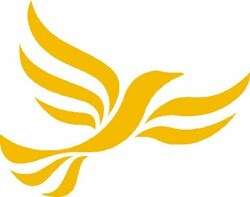 The Lib Dems main campaign is that their candidate is Local, where as the Tories are from out of town. The Tory candidate lives about 7 miles away. .. They are going need arguments stronger than that I expect. Question Time on Wednesday next week to make way for Tiger Woods.